Comic Shop Woman, Episode #002: On Not Building Walls - Comics Are Go! A customer walks in the door. Stops. Blinks. Looks around. Spots me. I’ve had this exchange with dozens of customers as they react to the new look of the store, and it always amuses me, at least. I can’t speak for the customer. Right from Day One taking down the wall was on the to­-do list. The back half came down pretty quickly with help from our kids. Then a couple of weeks ago, on one long Monday, the whole thing became only a memory. So why did we do it? Having a backroom to hide the mess seems like a good idea for a comic book shop. There’s always going to be stacks and boxes and unorganized things. It’s just the nature of the business. By taking away the wall we’ve left everything exposed. Even though there’s still work to be done in the former back room, we wanted it to be a part of the store. 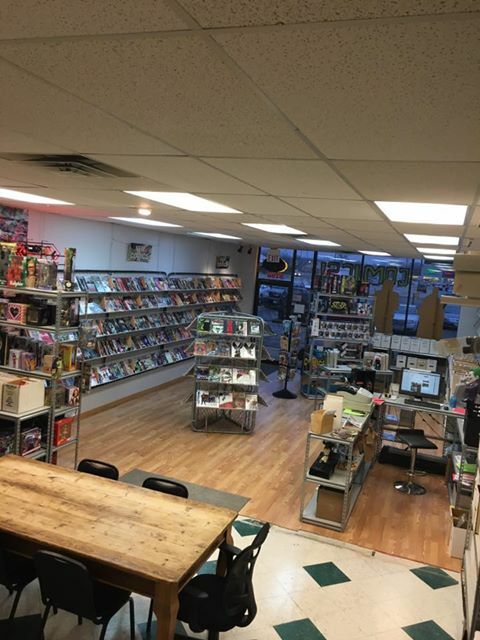 While Comics Are Go is known for having new comics and locally­-produced work, this store has a pretty substantial amount of back stock. By making the stock available to customers, we can be more inclusive to everyone’s comic book needs. And the store just looks so cool now! It’s a little like the wild west right now, but that’s okay; gradually, we’ll become more organized. The store is bigger, of course, and more inviting. The table and chairs are out in the open now, just asking for someone take down a box and in search of an old friend or a new favorite. Great job. It feels more open and “lighter”.